After selling for $1,449,000 almost 3 years ago, 4182 N Quail Canyon went on the market today at $1,099,000. Oh, that must hurt! 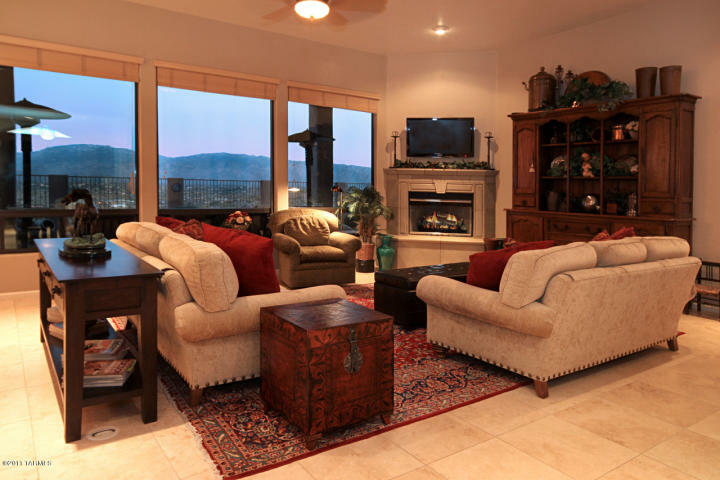 This beautiful ridge-top Santa Fe was built in 2004 and has over 4,200 square feet. (Click on the address to see photos and listing). Give me a call (520-615-2598) if you would like to view this beautiful home! 4079 N Sunset Cliff Place just came on the market 2 weeks ago, and was just reduced 25K to 400K. Hopefully this will put it back under contract soon! This almost 3K square foot home has a spool and spa; the floorplan is the popular Monterey-built one with large first floor master suite. 4458 N Sabino Mountain Drive just went on the market for sale at $1,099,000. This 3,500 square foot home (located on an acre homesite)had previously been on the market and took a few years to sell. Finally it sold for 938K in March 2008. The new owner did vast renovations that make this home much more appealing. The views are fantastic! (click on the address to view the photos and map location). Like 2010, 2011 has its first sale in January and it is of a similiar home–same floorplan–Monterey two-story home with first floor master suite–both have a pool (but this one has a spa, too). 4079 N Sunset Cliff Place, listed for $425,000, went under contract after only being on the market for a little over a week! Way to go! Click on the address to see the listing and photos. The final sales price is unknown until it closes escrow. 4079 N Sunset Cliff Place was listed today for $425,000. This 2,900 square foot Monterey-built home has a small pool and spa and although it is a two-story home, it features a first floor deluxe master suite. This house sold for $495,000 in 2006. Click on the following link – Sabino Mountain Homes for Sale to view current active listings. Click on the link ~ Four Sabino Mountain Homes Sold in 2010 which were the most expensive homes sold this year. They represented one semi-custom Outpost Home-N Ocotillo Canyon (570K); one semi-custom Monterey- Black Rock Drive ridge-top short sale (620K); one custom ridge-top home–Quail Canyon (875K) and one very exquisite, contemporary custom home on Boulder Canyon (900K). It was not such a hot year for the high-end sales in Sabino Mountain since none sold above the 900K mark that was reached in February 2010. The Quail Canyon recent sale (875K) would certainly have sold for over a million a few years back. Call me to review my market approach to selling homes in my beloved Sabino Mountain neighborhood – 520-615-2598. Click on the link – 4 Sabino Mountain Homes Soldin 2010 from $403,500 – $439,000 to see the listings of these four mid-priced homes that sold in Sabino Mountain. The homes that sold in this range were 2 semi-custom one-story Pepper-Viner homes on Ocotillo Canyon and 2 Monterey two-story homes that have the first floor master suite. Square footages of these homes ranged from 2,646 – 2,904 square feet. Remember to call me if you are thinking of selling your home – 520-615-2598. You are currently browsing the Sabino Mountain Blog blog archives for January, 2011.